The speaker market has a lot of tools to market. There are a lot of reviews on Bluetooth speakers, but there aren’t too many reviews on the best budget audiophile speaker cables. Before we start let us ask you this. Do you know the importance of speaker cables? If you said it brings electricity to the speaker then you’re correct. Instead of a simple answer like the one above to the first question, can you explain to me what a speaker cable does? Now…it’s more of a thought-provoking question, isn’t it? To answer the last question, yes it is. But what does a speaker cable mean to audiophiles? Because we know they can get very particular on the smaller details. Well, reading their answers they said speaker cables are electrical connections between speakers and amplifiers. Capacitance for a speaker cable is when 2 conductors are separated by an insulator. The word capacitance derives itself from the word capacitor. And a capacitor’s responsibility in an electrical circuit for a speaker is to store, take up, and discharge electrical energy. Generally, speaker cables aren’t as entwined with capacitance issues because speaker cables are mostly high current and low impedance. Most issues concerning capacitance issues deal with interconnection use. Some signs to watch out for regarding capacitance deal with the amplifier. Besides being able to provide energy to an amplifier, capacitors have multiple benefits to an amplifier. The first is they block direct current flow and pass alternating current flow. Direct current only goes in one direction. When all the electrical current goes in one direction it will always run into the capacitor. The problem is when the capacitor is fully charged, that’s when the capacitor has to start blocking the direct current flow. As for alternating current, the direction of its flow is bilateral meaning it goes both ways. A capacitor gains charge but also loses charge with alternating currents. It’s similar to flipping a half-full water bottle back and forth. For both direct current and alternating current problems, it’s like having a problem of having too much (direct current) compared to too little (alternating current). At least if there were one current to deal with then there would only be one problem. 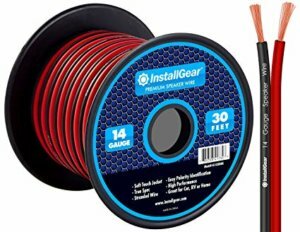 Figuring out how speaker cables deal with current is necessary to succeed. Inductance depends on the change of frequencies. Quick changes in current stem from high frequencies encountering high inductance. Low inductance happens because of lower frequencies. Do you know how inductance affects speaker cables? This means higher frequencies are traveling on the cable’s surface instead of the conductor’s center. When this happens it makes it hard for the cable to transmit higher frequencies. And there are 2 reasons for this. The first reason is the cable’s diameter. When a cable’s diameter increases it increases the skin effect occurring. The second reason the skin effect happens is because of the type of metal conductor used inside of the cable. Some metals are just more conducive to others. Overall, the skin effect makes sound transmission more difficult and less efficient. This makes it harder for sound quality to be good. Do you know why this is the most important factor for speaker wires? It’s because this is the biggest correlation to whether a speaker will sound good or not. But what exactly is resistance? There are multiple factors that affect a speaker wire’s resistance. And there are multiple characteristics which affect resistance. The first characteristic is the wire’s base metal. And this matters because different metals conduct electricity differently. 2 good metals which are commonly used in speaker cables are aluminum and copper. Overall, copper is the best, but aluminum and copper combined is a great combination because it conducts electricity effectively while lowering costs. The 2nd and 3rd factor that make up speaker wires are its length and thickness. Different wires like CL2 and CL3 speaker wires make a difference, but it comes down to length and thickness. Thickness is important because it allows the electricity to move around the cable. If the cable were thin then it’ll cause the skin effect described earlier. As for length, the more distance electricity has to travel, the more resistance there will be. Impedance also plays another role to resistance as you’ll find out soon. For a speaker wire’s impedance to be determined, there are 3 important factors to remember. The first 2 deal with a wire’s path and dielectric properties. The 3rd factor is a wire’s resistance. If the speaker’s resistance is high, then its impedance will be low and vice-versa. As you can tell, both resistance and impedance play off of each other. Both are critical when it comes to understanding speaker wires and which ones stand out from the rest. Keep all 3 factors in mind as we go over the best budget audiophile speaker cables. Outdoor speakers rely more on speaker wire coating because of its environment. Rain, snow, wind, heat, all give wear and tear given enough time. But don’t worry because this speaker wire covers that problem. What’s great about this speaker cable is its name. Silverback is a great name because it makes us think of its cable jacket, but it also reminds us of a strong gorilla. Both symbolize strength to some degree. Remember, how we said copper is the best for speaker cables, well, the strands in this cable are made up of all cable. The quote above is what the manufacturer states. 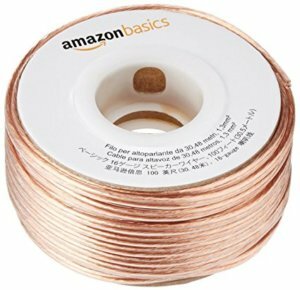 If you picture a bunch of tightly wrapped copper wires then you’ll know what they’re talking about. When you get a bunch of copper strands together like this your sound quality gets better. It’s able to reduce sound distortion because all the electricity travels across all those strands. The speaker wire delivers great bass, higher imaging, and cleaner tonality highs. Basically, it covers a range of frequencies with ease and efficiency. Corrosion + speaker wires = BAD! The manufacturers emphasize oxygen-free because speaker cables have a tendency to corrode with enough exposure to oxygen. When elements from the environment interact with a substance, that’s when corrosion starts to happen. Oxygen-free takes out the possibility of microscopic pockets and oxygen bubbles. In addition, its premium jacket protects the copper wires against any direct harm. Whether its people stepping on the cables or sharp utensils making a cut, the cable’s jacket is strong enough to withstand it. You should buy it if you’re looking for quality speaker wires. From quality sound to durable protection, this product is worth every dollar you’re willing to spend. If you make the investment now then you won’t have to worry about speaker wires for a while. One difference we noticed between this speaker cable and the last one is the connectors. When you purchase a set you get a connector that comes with it. Even better is the fact that the connectors have corrosion-resistant tips to prevent the wires from getting damaged. The soldered banana tips are also great for a secure connection and wear and tear from multiple insertions into a port. If you don’t have outdoor speakers installed then having these banana plugs will be perfect for indoor speakers you set up outside. Not only are they durable, but we know installing speakers take multiple insertions of the speaker cables. All that insertion creates that wear and tear. That repeated insertion can wear out regular speaker wires, but not this one. A flexible wire is an underrated part to durability. Speaker wires go through a lot of bending whether they’re going through a wall or laying around in the backyard. But this speaker cable’s material isn’t only good for that. It’s also a flame retardant and it has resistance to heat-insulation. But don’t mistake “flame retardant” as resistance to fire overall. It means if a flame were to start on the cable then it wouldn’t spread. Which is still bad, but at least it doesn’t get worse. If you were to barbeque around the speaker wires (we don’t suggest you do) you wouldn’t have to fret over burning them into ashes. Peace of mind goes a long way especially when you have a lot of materials to deal with. 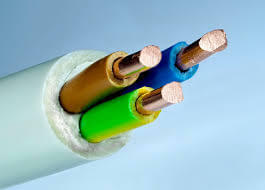 Furthermore, the cable is made up of polyvinyl chloride (PVC). The main reason manufacturers use this material is it doesn’t conduct electricity at all. If you’re a PVC owner who owns speakers then that’s music to your ears. PVC cables help wires transmit electricity easy making your sound quality beautiful. It has copper strands which are the best, and it’s not prone to damage. So not only are you getting quality but you’re getting something that’ll last you years down the line. A great plus to these speaker cables is it provides banana plugs with a purchase. Not something you can say for the first speaker wires we mentioned. 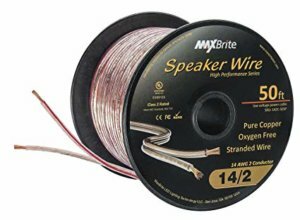 This speaker wire is the best one for someone who’s really on a budget. For 30 feet of wire, you only have to pay $10. The design of the wire is simple and sleek, but it also comes in different colors if that matters to you. Another benefit is the easy polar identification. This means matching speaker wires to the same source of polarization. For example, a battery has a negative and positive side. In products like a remote, there is a label showing the user which way a battery should go in. The same concept goes for speaker wires and outdoor speakers, or indoor speakers. Incorrect electrical wiring needs to be kept in check. Even a small outlet you’d take for granted can have consequences if you’re not responsible with how you handle it. 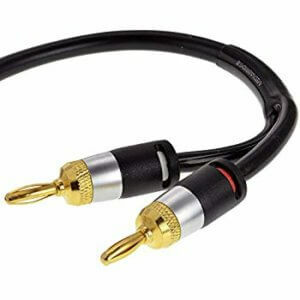 Although its simplicity might be a turnoff to some folks, this speaker cable’s simplicity also serves as an asset. With a soft jacket to protect it, it also works against crimp terminals. This makes it easy to route through car panels for quick installations. Another part of its versatility is the wiring capabilities it has for home theater systems. The soft jacket allows it to have banana plug attachments. This makes it easy to use with walls either placing it along the walls or inside the walls. But if you do place it inside the wall, don’t worry about termites or rats damaging it. The speaker cables have a rugged polyvinyl chloride jacket. For those on the lower end of a budget, this is great. Not only is it affordable but its harder to mess up with. What we mean by that is it can work whether it’s indoors or outdoors. But we do have to warn you about the wiring strands inside. The manufacturer hasn’t really mentioned anything about how much strands they use but we do know it’s copper. But what’s more important is how much wiring they use. Because what if they told us they use copper but only a thin amount? It’s like purchasing a bag of chips and it turns out the bag is only half full. Just something to ponder over while you contemplate whether you want this specific speaker cable or not. Another low budget option for the low budgeters out there. When you purchase this speaker cable you get 30 feet of speaker cable which is priced at $10. The first twist is its UL safety certified. Call it a marketing ploy or a gimmick but being UL safety certified distinguishes brands over others because of the reputation they hold. Businesses leverage this certificate because it is backed by science expertise. Each product they certify goes through rigorous testing and they also go through a variety of wires which means they have experience in this department. A consumer should take comfort in this as it demonstrates the manufacturer isn’t just about the profit. They’re actually trying to create a sustainable product that’ll last for years. A tidbit we wanted to mention even though it’s not a deal breaker is the sequence marker. Every 2 feet the wire descends from the reel to the core there is a marker that lets the user know. Its useful for those who use speaker cables and want to be exact with how much feet of cable you’re using. Not the greatest feature, but it helps with user experience. 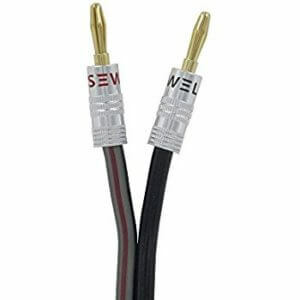 As we’ve mentioned before, this speaker cable is very similar to the last one we reviewed. But the safety certificate and foot measurement are little features that sway people. Would we recommend it to anybody? There is a reason why it’s on the list. Amazon’s speaker wires are rated the best on Amazon (I wonder why…). As you can tell by the picture there isn’t a polyvinyl chloride jacket. What’s protecting the wires is a plastic jacket. Although we aren’t particularly high on its durability for outdoor applications, plastic jackets are good enough for no sound distortion. When it comes down to it, sound distortion is the most sought-after quality. Or else why would you want speakers? If you’re an environmentally-friendly person then this matches your priorities. When you get rid of this wire you can dispense of it easily. The reason for this is its because its made of plastic. Even though the point of purchasing speaker wires is to make them last for a long time, we know with cheaper speaker cables, the opposite holds true. This is the ultimate starter speaker cable. The amount you have to spend for a 100 feet of cable is insane. For those looking for the most wire with the lowest amount of money then this is it. Other than that we would recommend going with another speaker cable because we’re worried about how durable it is. Unless you use touch speakers or Bluetooth speakers, speaker cables are a big component for any type of speaker you use. Remember the beginning of this post where we talked about the 3 most important factors to a speaker wire? Although we didn’t discuss each factor when reviewing each speaker cable, it’s important you take that into consideration before looking at each feature. After that take into account the cable’s jacket. Ask yourself if you’d be comfortable with a PVC jacket or plastic jacket and decide from there. Even though cheaper wires don’t have as many features, it’s still important to know which one lasts longer. Other than the obvious sound quality each wire provides, we hope you took something away from this post. Comment on this post to let us know what you think; whether you hate it/love it, want us to tackle a new topic, or just want to comment, we’re open for anything.